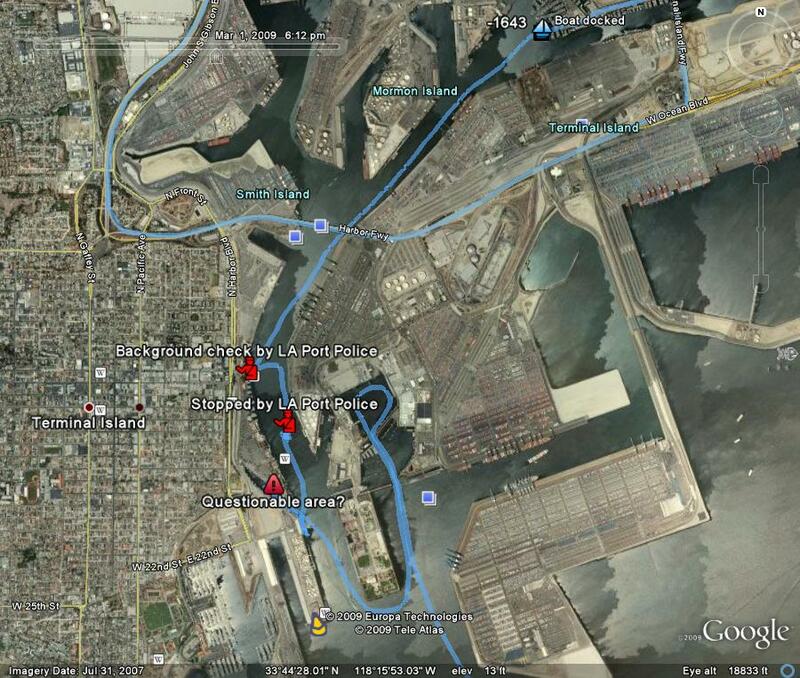 While sailing around the Los Angeles Harbor in San Pedro, we got pulled over the the Los Angeles Port Police. We couldn’t have been going more than 5 knots. Then again, I wouldn’t know because I wasn’t driving. We were sailing slowly, taking photos of random boats, old fisheries, pelicans, seagulls and sea lions. They asked if we knew how fast we were going, then stated that someone said we were going pretty fast. In addition, they had video of us taking photographs and wanted to make sure they weren’t of main fuel tanks around some berth. Initially, all of this was said looking at my friend, Danita. She wasn’t the one driving — it was her dad’s friend, John. At the time, there were two LA Port Police boats around us. We were ordered to a nearby public dock. Once we tied the boat to the dock, they asked Captain John, Danita and I for our ID. They also ran a background check. We showed them our photos from the time we were around the harbor. I had over 600 photos. 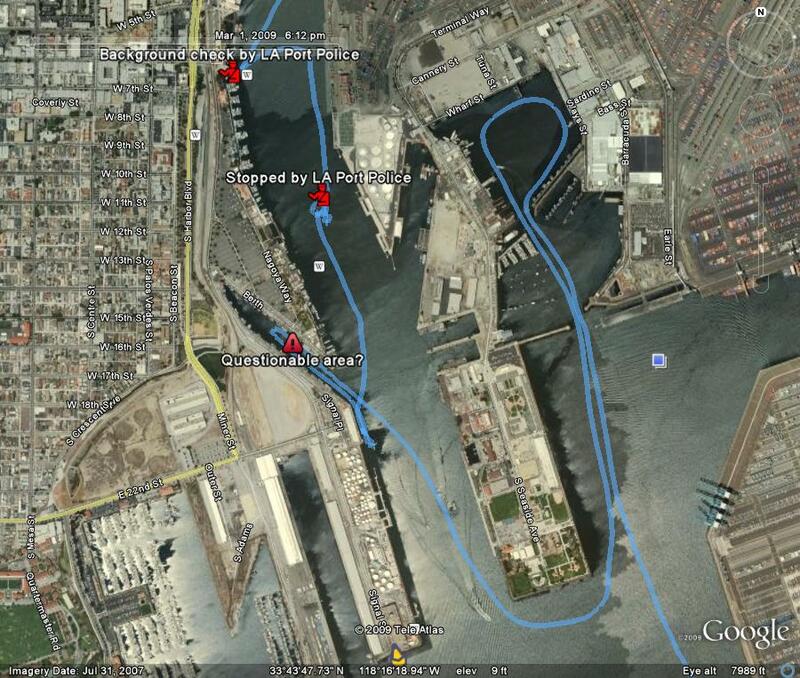 I quickly scrolled through the last 300 that pertained to the harbor. The officers agreed that there wasn’t anything that would compromise security. They explained that our getting stopped was a “warning,” but now we were on record for that and labeled a non-threat. Overall, he was very nice. Unfortunately, Danita was asked for her Social Security number. She knew that she wasn’t required to give that information, but the officer insisted that they needed it for their records, so she gave in. I wasn’t asked for my social security number. Why? Before we left, Danita suggested I take their photo. I was still pretty nervous and shaky, so I didn’t set my camera correctly. Captain John[1. Not really a captain, but when you’re a boat owner, that’s what you’re called.] later told us that he had no idea what we were doing wrong. He’s gone out dozens of times since 1992. Maybe hundreds. He has a two notebooks filled with the information from friends that have gone sailing in his boat. Fact: Danita was there two out of three times he’s been pulled over. 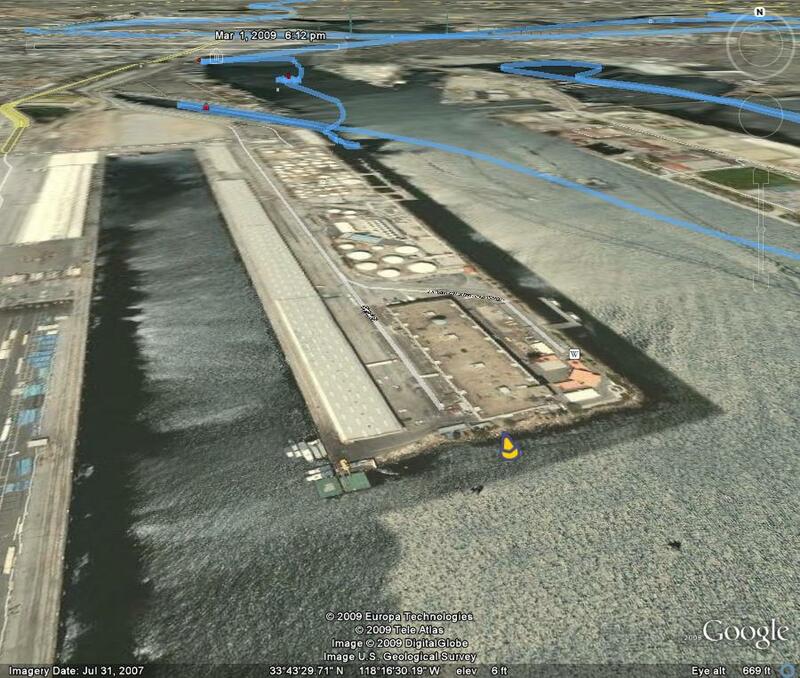 Upon arriving at home, I downloaded Google Earth to view the GPS trail while we were out. I marked it up so you can see where everything happened. So, what did we do wrong? Nothing. As far as we were concerned, those are public waterways. There were no signs to indicate otherwise. We went anywhere other small boats could go. An hour of time was wasted. Our information is in their office on some slip of paper and/or their computer system. Danita was asked to give her Social Security number, but that was wrong. What would’ve happened if she refused to give them that information? What if that data gets lost? It wouldn’t be the first time. Were my Fourth and Fifth Amendments broken in this instance? Being in a public area, weren’t we free to photograph as we please? Would they stop a cruise ship if some of their passengers had DSLR cameras with super telephoto lenses? Can someone point us to a link or two to prove where photographs were used to help plan a [terrorist] attack? Please don’t confuse my questions as a desire for security to be taken lightly. The problem isn’t with the enforcers, but rather the people that decide what needs to be enforced. I don’t want to sit on my hands and do nothing about this. You may view photos from this trip within this Flickr photoset. Ugh. Every day it seems like we come closer to a police state. Sigh. What a crummy thing to happen. I tried but it did’t happen. Harbor Police rules: Laws do not! When LA police chief Bill Bratton and county sheriff Baca make their strides in cooperation with state and federal entities to make LA’s harbors arguably the most secure in the nation, I think it is obvious in their intention that situations like yours are completely outside the authority afforded to officers and deputies. Therefore I take more issue with the officers than I would policy makers. How much common sense do you need to realize that US citizens, and to that note, Los Angeles area residents, who are otherwise law abiding and cooperative, are not posing any sort of security threat? You might have been speeding, but even then, that presumption can only afford so much of a threshold for their lawful ability to investigate your boat or your person. SSN numbers are off limits. Even photo ID’s should not be forfeited, with the exception of the driver’s. Looking at your photos? completely out of the question. What about your person, appearance, language, associations with the boat and its owner gives them any indication that your having taken photos is of any threat to anybody, let alone the harbor and its crucial use of our nation’s? The problem is these officers are preying on their own boredom, a false sense of fear/panic in the culture, and then your lack of confidence and knowledge of their can and can nots. I don’t think there is anything prohibiting them, nor should there be, from stopping any boat at any time under the guise of a security threat or otherwise. Coastal waters pose situations that need a lot more immediate authority on the part of law enforcement to detain a boat. However once the presumptions that initiated the detainment can easily be disregarded by common sense and/or minimal and lawful investigation, you should be let on your way. Yeah, most cops are cordial, friendly, and respectful. But who cares if a cop can smile, doesn’t mind listening to your fishing stories, has his own to tell you, etc etc, if you’re not allowed to move along freely, timely, and lawfully? If you got their badge numbers or names I would lodge a formal complaint about their actions to their immediate superiors, your friend should definitely attempt to get her SSN purged from their records, they have no right to keep it. @Dave: Thanks for the suggestions. Since I was with those friends who were cooperating, I didn’t want to make drag out the “incident” longer than necessary. I’m definitely kicking myself. Can you suggest any documentation I can read/present to those superiors when I make that formal complaint? @Andre: Yep. It’s out of hand. @Brian Auer: I don’t know, man. By the way, is that a good or bad thing? the govt knows there is a proliferation of cameras out there and that is a potentially very dangerous thing when it comes to the control of information. witness: oscar grant, rodney king, tiananmen square, coverage of vietnam vs coverage of iraq, etc. so while they continue to install information-gathering devices EVERYWHERE, they simultaneously attempt to limit your freedom to carry YOUR camera ANYWHERE. Seriously… I think you’re turning into the next Thomas Hawk with all your recent run-ins. What’s the dealio? I used to oversee port security, I’d be happy to help answer your question, but not over a public blog. Feel free to email me directly. @Tor: Thanks for the comment. I’ve emailed you. bryan, you’re a magnet for this kind of harassment. i just wished you would stand up for yourself and tell these guys “no” when this stuff happens. i can’t believe your friend gave them her social security number! that’s insane. Ridiculous. Sorry buddy. lol @ Brian Auer’s comment. we used to boat in the harbor all the time and I work in he harbor, post 9/11 they cracked down on us taking out boat, and tying up to different container terminals and going in with our co workers for lunch, anymore you have to stick to the main channel something like 100 feet from shore except a few areas. by your pictures, Im ASSuming you cam in angles gate first, then went in by berth 300 back out around to the main channel got stopped by port police, then hit a dock for the ID check. if thats the case I will tell you, you went by a lot more security sensitive areas then you realize, taking pictures the whole time, and into a few finger channels that are off limits to private boaters. It’s always the dumbasses that don’t leave any real way to contact them. And lol at “You are idiot Bryan,” I’m going to use that from now on when insulting you. One day LAPD will be taking them over. And you CAN take pictures of whatever you want!!! Yeah o.k. Just like they took over the airport. the question you were asked are on the standard field interview card which is used throughout the city. LAPD uses the same exact cards. Bryan, you are without a doubt a talented photographer. [Although] I expect to be [criticized] for my comments here, I certainly respect your [art form] and your rights to legally photograph anything or anywhere you wish. The problem is that regardless of how much people may wish things were the same, times have changed in the last 8 years. 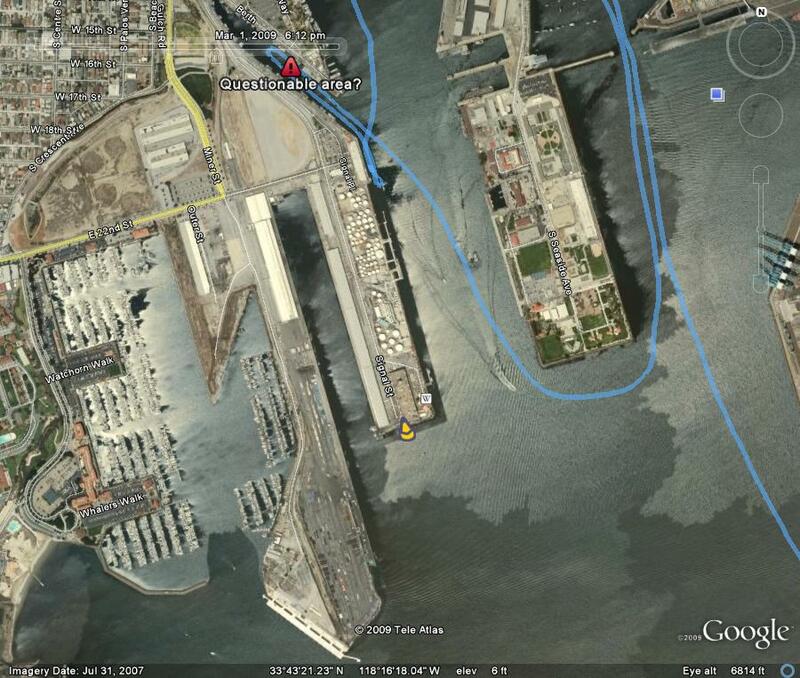 The Port of Los Angeles is an industrial seaport, the busiest such place of commerce in the western United States. Any act that were to stop the commerce through this port would very literally cripple the economy of this country quite quickly. 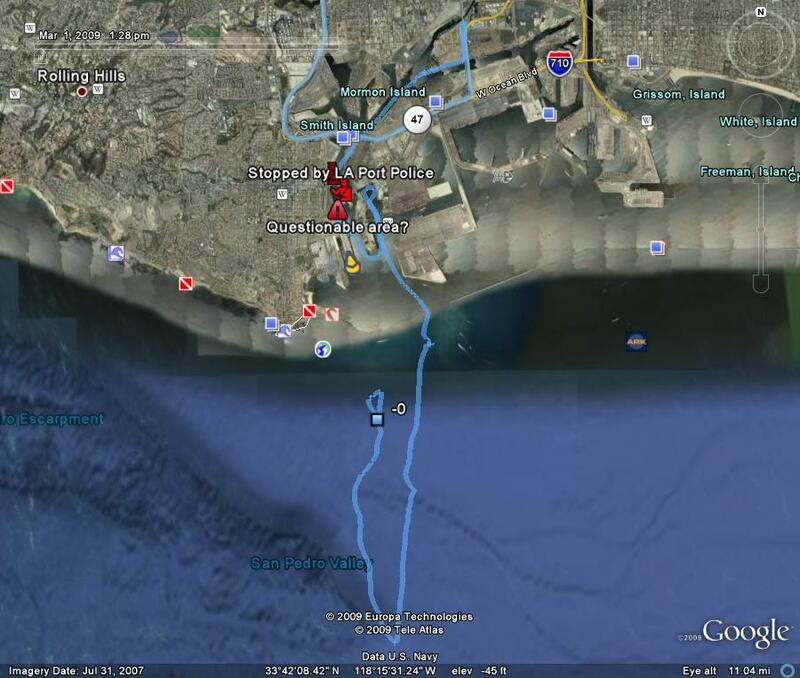 The location you were stopped is directly adjacent to a large fuel storage terminal. 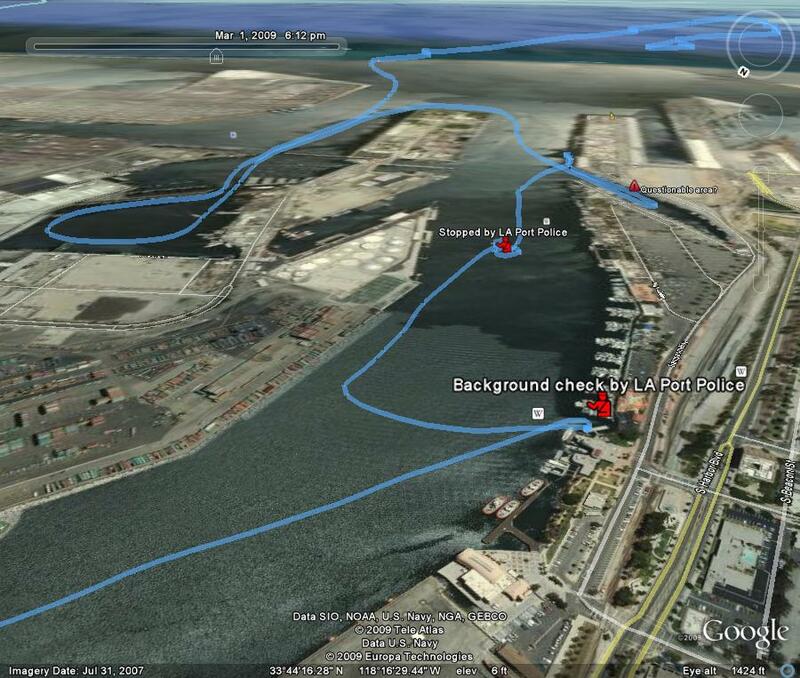 To be more specific, according to your GPS maps, you traveled directly along the edge of the Pier 400 container terminal and adjacent to a federally mandated controlled navigation area (CNA), into a place called fish harbor where you then passed along a vessel fueling dock and commercial fishing mooring docks, then you came out and passed along the back side of Terminal Island Federal Penitentiary (CNA), Terminal Island U.S.C.G. Base (CNA) and the U.S. Immigration detention facility (CNA). Then you made your way north up the main channel and into the berth 73 commercial fishing docks which also houses Mike’s Marine fueling station as well as the much larger Jankovich fuel storage and filling facility. Then you were stopped in the main channel across from Exxon-Mobil fuel and oil storage and pumping facility (CNA). Your boats owner was (possibly) speeding or creating a wake which is also illegal and hazardous to the marina residents and their vessels who live a few hundred yards from where you were stopped. The boat operator was unable to find his federally required registration which would very understandably warrant a further check at a safe location (you wouldn’t expect to park in the middle of the 405 fwy when CHP stops you would you?). Additionally, it should be noted that as an industrial seaport, the law allows for any vessel entering it’s waters to be boarded and inspected for [adherence] to the local safety mandates. That law can be found in the Tariff. The matter of officers requesting identification is also a sticky [subject]. If an officer anywhere in California is conducting a lawful investigation which involves you, then you are required to present them with valid identification or else you can be charged with obstructing or delaying an investigation. In your cases you were asked for information for a field interview card. This documents who the person being talked to is, their specific contact information, physical description, etc. The social security number portion which is on the card is commonly used to discern between people with similar names or other characteristics, or to identify when someone is attempting to use someone elses basic information when they have committed a crime. Ultimately the field interview cards can also be used to document who and why the officers make contact with while working, there is no grand conspiracy behind them. The more people present at the scene then the longer it takes to speak to them, figure out inconsistencies in their stories, fill out the cards the officers are required to write, [etc.] Most officers ask for the social security number as a matter of routine [because] over the course of a shift they probably fill out a large amount of them and officers are trained to complete paperwork to completion as a rule. As far as looking at your pictures, how else is someone supposed to try to determine if you are taking pictures specifically focused on sensitive areas or that detail the structural characteristics and vulnerabilities of a bridge or million gallon fuel tanks or security camera locations? Can you imagine for even a moment what a delicate balance it must be to try to protect someplace that is openly accessible by 43 miles of waterfront, 3200 acres of water, 1 million jobs in California and accounts for 20% of all goods that enter the entire country? And to top it all off they do so 24 hours a day, 7 days a week while praying someone with bad intentions doesn’t go unnoticed and end up hurting innocent citizens such as ourselves. It would be like trying to stop a leak in a bucket with 100 holes. And all the while the officers who are humans with the same emotions as you are required to do the job while enduring primadonna attitudes, egomaniacs, liars, mentally ill, almost mentally ill, perverts, criminals, every manner of rude and [belligerent] moron, innocent yet uninformed citizens, and occasionally a few truly nice normal people. I would imagine that you and your friends fall into the last category of nice and normal people. You seem to forget however that you go out into public places specifically looking to see if you get [“harassed”] by law enforcement. You can’t have it both ways. Either you are a nice normal guy who likes taking pictures, or you are an antagonist who wants to push the limits of what you can get away with. But how can you go to a place that you openly admit is a high security area, perform actions consistent with common intelligence gathering methods anywhere else in the ENTIRE world and not expect to have someone verify that you aren’t a bad guy? By the way, did the officers give the boat operator a ticket or a warning? Would you seriously prefer that the people responsible for protecting the 70,000 residents of San Pedro (not counting the additional several thousand who work in and next to the harbor every day) just turn a blind eye when they observe or someone reports activity that could even be a remote possibility of leading towards another attack on our soil? Really, how else do you suggest the job be done if that is the case? Lastly, I just want to repeat that I mean no ill will towards yourself or the community of photographers who enjoy taking pictures of industrialized areas. As you said yourself, photography is not a crime, but unfortunately when specifically centered around fuel terminals, prisons, chemical processing plants, bridges, railroads, cruise ship terminals, ferry’s, [etc. ], photography can be and is used to help bad people do bad things. Also, think logically, information regarding plots that were foiled involving [photography] as a means of gathering intelligence by terrorists are not going to be [publicized] as to details. I do not personally trust most of what I hear from mainstream American media as 100% accurate myself, but I know that the government is not going to advertise a bad guy taking pictures of [Disneyland’s] exits, or of the structural joints of the Brooklyn Bridge because they don’t want to alarm the public or give [nut job] copycats ideas on how to disrupt the order of things. Not all terrorists come from other countries as demonstrated by Oklahoma City, Right to life bombers and shooters, Animal Rights extremists, American Muslim extremists, extremists in general. I am including the [web links] to a few open sources of information where I got some of my information from below. Nice reply, BUT- the waterway is a PUBLIC DOMAIN, and there are NO laws against filming in a public domain. Unless they were boating in a marked and defined restricted area, or as you emplied they were creatinga violation of the states harbors and navigation code- thee was simply NO “PC” ( probable cause) for the boating stop- guarantee you the officers knew this ad that’s whhy a citation wasn’t issued. Blaming the “excuse” on “Post 9/11” is getting old for lame civil rights violations for any Police officer to jam up citizens- what next, “your papers, please Sir?”( oh, that’s what happened isn’t it?) the citizen here had the RIGHT to say NO to allowing access to their camera, and DID NOT have to give anything other than a name if they were not operating the boat; refer to Hiibel V. 6th judicial district of Nev. and Terry V. Ohio- This coming from another police officer that’s in a similar type of Law enforcement at those “port of LA Wardens”…. That was a pretty good story. I especially liked the pictures of the guys acting all pimp after they busted you. They were probably just bored that day, and I’m guessing they asked for Danita’s SS# so they could look up her phone number and call her. That’s pretty lame that they wasted your time like that. You should bring donuts next time, and just throw some to them if they get close, and then they’ll get sidetracked, and you can make your getawayz. When you went through that whole GPS list, did it occur that you used public information to determine the itinerary. There is nothing they saw and photographed that can’t be simply pulled down from google earth and a website or two. You’re right, security and police don’t know who they are and what they’re doing. But instead of simply pulling up and asking, photographers are met with “you can’t take pictures here!” This happens over and over, and is well documented by people who have no other agenda than to take photos like those Bryan took for stock photography or art. When security and police get away with telling you that “you can’t take pictures here” when it is settle law that they can, they are emboldened to do the same again and again. On each of these ‘street actions’ we did nothing different that any other photo walk that a camera club might take. We didn’t act suspicious. We simply walked down a sidewalk and took photos. Several months ago, Bryan, myself and a few others challenged security guards at the US Bank tower. They told us all sorts of coercive lies– they own the sidewalk, they’re calling the cops, etc. So, we called their bluff– we called the cops ourselves. The officer on the phone told us ‘It’s a free country” and that we could continue to take photos in front of the building, but the security guards refused to talk them. This is all pretty well documented with video, audio, and still photographs. When we returned to the US Bank tower last weekend, we were met by security with a “courtesy card” that said the security company understands photographer’s First Amendment right to take photos in public. A big change from last time. The card went on to say they will check out and report suspicious activity to police. That’s fine, they should. But don’t come running out of the building saying we can’t take pictures. Damon, After spending a good amount of time reading the stories of many photographer who object to being stopped, I think I have a better understanding of the predominent mindset which appears to be a community of artistic and generally well meaning folks who enjoy photography. I also think that there are always going to be people who are defiant no matter how justified the instances are when they are questioned. I think that at least a portion of the problems stem from employees and security personnel from privately held properties who are both misinformed about the law and who are either ordered to or feel an obligation to act on the behalf of their respective properties. I certainly would not say that all law enforcement officers are always perfect and have the greatest personality 100% of the time, but I do know however that 99% of them truly are doing the best they can with the information and resources afforded them, and 99% of them truly do so with the utmost of good intentions. Law enforcement officers are employees with a prescribed mission or goal just like any other organization, however their mission is to ultimately ensure safety and not necessarily to make everyone in the public happy about the way they do so. We don’t usually ever hear about a cop or government official being helpful and kind because it doesn’t capture people’s attention. So unfortunately it only takes a few instances where an officer is perceived as (or is truly) being rude or aggressive before that particular scenario is then held up to the light of the public opinion as proof of how poorly a particular group is treated “all the time”. You are right Damon, it is a an unproductive strategy to simply demand people stop photographing, especially if the people aren’t doing anything wrong. I can definitely understand why people such as yourselves would take offense to this. I don’t think it is necessarily a case where officers are saying “you can’t photograph” because as we all know that is incorrect so long as it’s done from publicly available points of view. 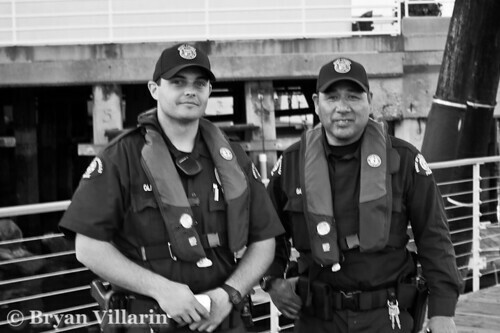 I live and work here in the port and I have seen with my own eyes the officers speaking as politely as they can while still doing the best they could to determine that the people were not a threat. It’s more likely that the photographers are unhappy with being stopped in the first place on a matter of principal. In regards to your opinion that pictures taken in public can’t be used for bad purposes..are you kidding? So with a 10 or 15 megapixel camera and a long lens you dont think there is a difference between extremely detailed images of structures, bridges, mass transit facilities and fuel and chemical plants and aerial view or streetlevel google pictures? There is a huge difference as far as what kind of details can be gleaned from publicly available images. That’s spefically why the images arent able to be viewed in fine detail. Lastly,although from your point of view as a photgrapher your actions are no different than walking down a sidewalk capturing artistic images, the fact remains that the cops job is to be on the lookout for ANYONE that might be gathering information to be used for a later attack. If they failed to stop and talk with you then they would be doing a disservice to their agency, the residents such as myself who live here, and the nation that would be ultimately be affected economically. No matter how much anyone doesn’t like it, the fact remains that the very freedoms we enjoy and covet so much in our country are exactly what makes us more vulnerable than just about any other country on earth to future attacks. I know that it’s an unfortunate situation but it isn’t going to change. My last question I had for Bryan was that although he was annoyed at his “time being wasted”, were the port cops at least courteous or professional while they dealt with the boating group? They don’t exactly appear to be gestapo thugs in the picture that he took. In any case, I wish you all well and really do appreciate the amazing pictures you take. I think I will be signing up for a class and learn how to properly utilize my own DSLR. Peace. Ian, it’s always great to hear some other points of view, and not just hear the ra-ra of people pushing a pro-photography agenda, but please, please break your posts up into paragraphs. It’s nearly impossible to wade through an entire page of text with no line breaks. As to the issue, anyone wishing to make an attack on the port doesn’t need to do recon with a massive camera, they can drive down the street, do research on the internet. Take your own information regarding fuel storage locations and pumping facilities… tisk tisk, you may have just helped some terrorists, information is dangerous. Seriously, if someone wants to do some damage, there is little that can be done to stop them. They don’t need any recon, they don’t need a big dslr and a telephoto lens to take pictures of the port. This illusion of security is just that, an illusion, a grab for power, and if people don’t stand up and stop it than we all lose. Yes, the current climate we live in can be traced directly back to Bush and cronies circa Sept. 12, 2001. The fear-mongering, and really if you want to be perfectly honest, propaganda, was instituted to keep Americans scared shitless and willing to give up their constitutional rights (and not care about civil rights for others) in the name of protecting themselves from terrorism – and so the government could do whatever it wanted (wage war, torture, illegal wiretap, etc.). That’s fact. And I don’t say this is as some leftist revolutionary wingnut; I am actually very moderate in my politics. I think if you “do not personally trust most of what I hear from mainstream American media as 100% accurate” then you shouldn’t trust what the government says as 100% accurate. There’s ALWAYS more to the story. And I believe you CAN be 2 different guys. On that day in the boat, Bryan was on a leisurely trip with friends, taking personal photos. Then he turned out 4 months later at a protest for photographers’ rights. Why are they mutually exclusive? It is perfectly legal to take photographs in a public place. Why are you willing to give up those rights? If that’s not allowed, then what’s next? Slippery slope, yo. Johns an idiot. If you’re going to write a post, try doing it so it makes sense. The fact there we’re two Port Police boats leads me to believe someone called the Port PD and reported you. Traffic stops on the water are usually conducted by the observing vessel. Additional vessels may be dispatched if warranted and a traffic stop doesn’t usually warrant a second vessel. Not true , Port PO- have boated out of your area many times, and the ” novice” officers you now employ do alot of lame and immature things while operating your patrol boats, including-“yes” lack of PC stops. this is something alot of younger officers are doing these days- they aren’t being properly trained on developing PC, and the courts have long ruled that vague phone calls of unsubstantiated acts are NOT probable cause to stop or detain…..